One of the most important revolutions in healthcare in recent decades is the increasing use of lasers. 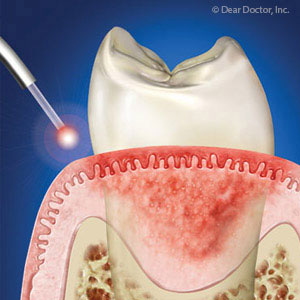 Now, laser technology is making a showing in dental care for the treatment of periodontal (gum) disease. Lasers (an acronym for "Light Amplification by Stimulated Emission of Radiation") narrowly focus and amplify light within a small area. First developed in the early 1960s, laser technology rapidly advanced in the ensuing decades with more compact and precise devices that were eventually safe and effective for many types of medical procedures. Its remarkable features are now available for the primary focus of gum disease treatment—removing bacterial plaque. Plaque is a thin, built-up film of bacteria and food particles on tooth and gum surfaces that serves as a haven for the bacteria that cause gum disease. The continuing presence of plaque and calculus (tartar) enables the infection to thrive and advance within the gum tissues, ultimately damaging them along with supporting bone. As the tissues weaken and bone volume diminishes, the teeth are at greater risk for loss. It's necessary, therefore, first and foremost to remove all detectable plaque and calculus to stop the infection. This is traditionally done with special hand tools called scalers used to manually remove plaque, or with ultrasonic equipment that vibrates plaque loose to be flushed away with water. These procedures can take numerous sessions and may result in some minor post-procedural discomfort and bleeding during the cleaning. But lasers specifically designed for plaque removal can minimize tissue damage and resulting discomfort. Because the particular laser light used reacts only with plaque and diseased tissue, it can remove them without disturbing nearby healthy tissue usually more efficiently than traditional scaling. Dentists who've used the technology frequently report less bleeding and higher patient satisfaction. But before lasers for gum disease treatment are widely adopted, the procedure must undergo further scrutiny. Reports from dentists notwithstanding, not enough research studies have been performed to date that meet the necessary scientific criteria. But if the evidence so far from the field holds up, it's quite possible lasers will one day become a regular part of dental practice for treating gum disease.